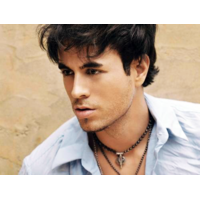 Enrique Miguel Iglesias Preysler (born May 8, 1975), better known as Enrique Iglesias, is a Spanish pop music singer-songwriter. Iglesias started his musical career on Mexican label Fonovisa. This helped turn him into one of the most popular artists in Latin America and in the Hispanic or Latino market in the United States, and the biggest seller of Spanish language albums for a number of years. Before the turn of the millennium, he made a crossover into the mainstream English language market, signing a unique multi-album deal with Universal Music Group for an unprecedented US$48,000,000, with Universal Music Latino to release his Spanish albums and Interscope to release English albums. In 2010, he parted with Interscope and signed with another Universal Music Group label, Universal Republic. Iglesias has had five Billboard Hot 100 top five singles including two #1s, and holds the record for producing 21 number 1 Spanish-language singles on the Billboard's Hot Latin Tracks. Up until the release of his latest album, Euphoria, in 2010, he had sold over 55 million albums in both English and Spanish. He has also had eight #1 songs on Billboard's Dance charts more then any other single male artist.